Review taken from Kyle's Entertainment Reviews Blog. The innocence, the heartbreak, the fame and the price of success—these are the many intertwining themes found in My Week with Marilyn, in which Michelle Williams stars as the acclaimed Hollywood icon. 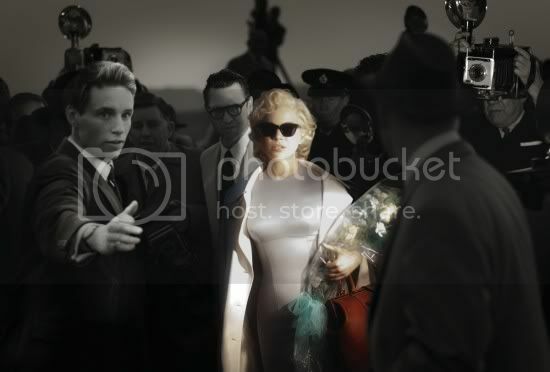 Directed by Simon Curtis, My Week with Marilyn documents a week of Marilyn Monroe's life told in the perspective of a young man, Colin Clark(Eddie Redmayne) who aspires to work in the film industry. Based on the real life Colin Clark's novel, the film takes place during the time when Monroe was working on her film The Prince and the Showgirl. Michelle Williams is to be praised immensely here for her work, as she manages to brilliantly capture the heart, emotion, and depth of a complicated person. Alongside of her, the cast also stars Kenneth Branagh as Sir Laurence Olivier, Emma Watson as Lucy, one of Marilyn's on-set helpers; Judi Dench as Monroe's costar, Dominic Cooper as Milton H. Greene and Eddie Redmayne as Colin Clark, the youthful and untainted love interest of Williams' character. The film's narrative, which documents the day-to-day life of Monroe on the film set is simple in a way that it works. The real depth, is found in the movie's emotionally invigorating characters, whose tangled relationships is only further complicated by their film's star, Miss Monroe herself. And although Monroe is portrayed as a actress shoved into a world of fame who needs constant attention, you can't help but feel sorry for her thanks to Williams' portrayal, which adds a level of emotional vulnerability to the role. Alongside Miss Williams, Eddie Redmayne's character Colin Clark, who serves as the audience's eyes into the world of Marilyn Monroe's film career, provides the audience with a relatable character that is easy to root for. Redmayne brings a vulnerable innocence to the character that makes him not just likable, but lovable. My Week with Marilyn is most likely going to catapult Michelle Williams to her second Best Actress nomination come Oscar season. Her portrayal of Monroe is impeccable, and the flawless cast supporting her makes this film about the account of a young man's experience working with an icon a memorable one.